Gone are the days when the seller was the king and the words “caveat emptor” echoed in the markets. Today the scenario has reversed. With monopoly long dead and the advent of numerable brands, the seller has been dethroned. Selling a toothpaste to toothpaste making machineries is a feat for many marketers, each brand has it’s USP and given that people are dynamic, no indigenous marketing strategy can be stuck to. As they say, desperate times call for desperate measures. Marketers are forced to hard sell by reducing the per unit price of the product or increase the per unit volume for the same old price. Either way they hard sell their products to finish the old stock. However, by employing more means of selling the product they hard sell to deplete their old stock reserves and make a margin profit. Once they hard sell, they stick to it. That’s fatal for their brand. Hard selling comes with more disadvantages than advantages. 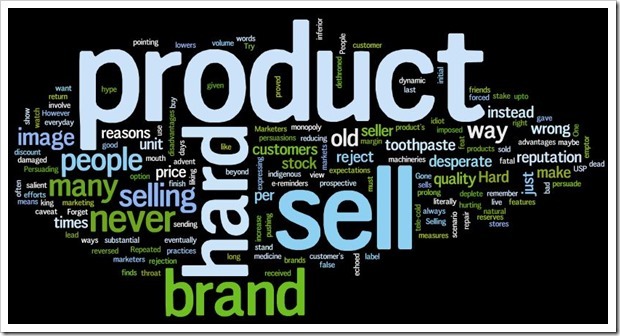 Some of the many reasons why you shouldn’t hard sell your product. One of the most important reasons why you should never hard sell is people view your product to be of an inferior quality. When you sell your product at a substantial discount %, people doubt your brand image and the quality of your product. A few who buy maybe proved wrong with your product’s prolong use but many people will reject your brand right away. So never underprice your product to hard sell. When your are hard selling, you’re not merely pointing out the salient features of your product, you are literally pushing the product down your prospective customers’ throat. Persuading them in stores, sending everyday e-reminders, tele-cold calling are practices you should never involve in. It’s natural to reject that which is imposed on us. Repeated efforts to sell your product are often received with more and more sighs from customers. Try not to persuade them, instead just stand and watch what your customer’s initial liking is to, and show them more of what they like than more of what you want to sell. Once you hard sell, it lowers your brand reputation. Don’t you? Not all of the times, your product will live upto your expectations. Once you hard sell and the customer eventually finds out the hype you gave the product is false. He’ll never return to you. Forget expressing his disappointment to you, he will instead bad mouth your product in his friends circle. That has ways of hurting your brand image way beyond repair. Hard selling must be the last resort but never an option. What we hard sell is just not the product, it’s also the brand reputation at stake. The only way to sell your product is to make your product so good that it sells itself!